Thank you to all those who donated on Colorado Gives Day! PATH Intl. raised $185 on the day alone, and continues to accept online donations at GivingFirst and on our main website. On our website, you can also download a form and mail it in to the office. Don't forget to donate by December 31 for the 2011 tax year! Have you seen the flag counter at the bottom of the PATH Intl. homepage? What started out with just a couple of countries represented on June 7 jumped to well over 40 in three days with most countries showing multiple unique visitors. It has now grown to visits from 142 countries, with someone from Syria being the most recent visitor. We truly are an international association! Please Donate to PATH Intl. Today! Please consider giving to PATH Intl. today! Thanks to our generous donors, the Professional Association of Therapeutic Horsemanship International is helping to reshape lives every day. * You can help a PATH Intl. center teach its staff and volunteers to practice the very best in equine-assisted activities and therapies (EAAT). * You can help PATH Intl. centers sustain their excellence and safety in the field of EAAT. * Together, we can appreciate the power of the horse to change lives by supporting PATH Intl. today. During this season of giving, please consider donating to PATH Intl. Thank you so much for your support. The PATH Intl. office will be closed from December 24 to January 3. Regular office hours will resume on Tuesday, January 3, 2012. You will still be able to access your account from the website if you would like, and you will still be able to make year-end donations through the website. Task force applicants with experience in developing and editing bylaws, knowledge of nonprofit governance and strong writing skills should submit their resume and brief cover letter demonstrating experience and intent by January 5, 2012, to Madelin Schlenz. Thank you so much for your interest in helping in this important task. Effective November 11, 2012, the association began implementing a new policy affecting PATH Intl. Premier Accredited Centers. Should a PATH Intl. Premier Accredited Center allow its PATH Intl. membership to lapse, its accreditation status also lapses. A reinstatement process to regain PATH Intl. Premier Accredited Center status is required if the center rejoins the association. Click here to see the full policy. This policy recognizes the continued commitment to the PATH Intl. standards of safety, ethics and professionalism Premier Accredited Center members make. It is with sadness that PATH Intl. says good-bye to Membership Representative Jared Smith. Jared started with PATH Intl. a year and a half ago, and many of you knew him as he helped with your membership renewal and certification questions. He is leaving to pursue a career in real estate. We'll miss you, Jared, and good luck! Former PATH Intl. 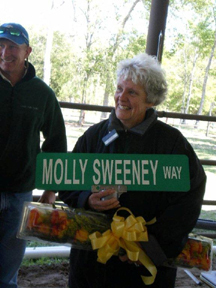 Board Member Molly Sweeney has been named the recipient of the prestigious 2011 The EQUUS Foundation Humanitarian Award presented by United States Equestrian Federation (USEF). The presentation will take place January 14, 2012, at the USEF Pegasus Awards Dinner in Cincinatti, OH. The award is a celebration of the humanitarian achievements made by a member of the equestrian world. It spotlights the selfless dedication one individual or a group of individuals has made. Molly was selected for her local and national-level volunteer work for over two decades in the EAAT field. Molly became a PATH Intl. Board Member in 1996 and served as secretary of the board from 1998-2002. She was awarded the President's Award in 2005 for her outstanding contributions to the Association. In 2010, she received the PATH Intl. James Brady Lifetime Achievement Award. Winter is upon us and many of us have been faced with whether or not to blanket our horses. It can be a confusing decision. I hope the following tips will shed a little light on when and why we should blanket our horses. There are a lot of factors to take into consideration. Before we make any decisions regarding blanketing, we need to understand our horses, their lifestyle and the environment in which they live and work as well as their breed and history. Mother Nature has taken good care of the horse. The average, healthy horse that has access to good quality hay and shelter from the elements will fare well in the winter months without a blanket. As the temperature drops and the days get shorter, most horses grow a longer, coarser, thicker coat. The hair has the ability to fluff up, trapping warm air and creating layers of insulation. Additional oils build up that add to the insulation and give extra protection from wind and precipitation. When winter days are a little warmer, the hair can lay flat to help the horse stay cool. Grooming this type of horse should be kept to a minimum because vigorous currying can disrupt the natural protective layer of oils. Blanketing early in the season will most likely hinder the natural growth of the winter coat. This may be desirable if your horse is worked consistently and cooling and drying are issues; or if you show in the winter and want your horse to have a sleeker coat. Some horses are not able to grow a thick enough coat and may benefit from blanketing. Those horses may include old or ill horses, pasture horses who have limited or no access to shelter, horses that are moved to a colder climate and haven't had time to acclimate, clipped horses and show horses that have always been blanketed. Some breeds like the Thoroughbred may not grow thick winter coats while others like the Haflinger may grow very thick coats. The type and weight of the blankets you choose will depend on the breed of your horse, his coat, lifestyle and the environment in which he lives and works while also taking into consideration the varying temperatures and elements he is exposed to. If you choose to blanket your horse, a combination of different weight blankets will help you keep your horse comfortable during the changing winter weather. Stable blankets are designed for horses while they are in a stall while turnout blankets are designed to allow for running and playing and are well suited for the horse that spends time outside. They both come in a variety of weights from a light sheet to a heavy blanket. The horse that is used to being outside may not need a blanket at all when he is brought into the barn. If your barn is warm or the temperatures rise, your stable horse may also be comfortable without a blanket. Although the outside horse with a thick winter coat may not need a blanket, he may benefit from the extra protection of a turnout sheet during inclement or cold and windy conditions. If this is the case, you should look for a breathable, waterproof sheet that will keep him dry while allowing moisture and heat to escape to avoid sweating. Blankets that are too heavy will have an adverse effect on the horse, causing the horse to sweat; as the sweat freezes the horse will become chilled. In order for a blanket to be beneficial, the synthetic insulation needs to be more effective than the horse's natural insulation. When deciding whether or not to blanket our horses we should also keep in mind that blankets can become ripped and damaged and may need repair or replacement. Blankets should be removed a couple of times a day to check for dirt, dried mud and shavings that can get under the blanket and to check your horse for rubs or sores that a blanket may cause. It also ensures the blanket is on properly, with no twists, pulls or rubs, and the straps are all fastened properly. While blanketing your horse, it is important to be diligent about paying close attention to the weather forecast so you can not only choose the appropriate blanket but also, in areas where temperatures fluctuate throughout the day, to have someone available and prepared to remove, add or change the weight of the blanket during the day. Mother Nature has done a great job taking care of the winter horse. I hope these tips help you decide whether or not your horse could use a little extra help from a blanket.